Use Comments Manager to quickly insert, edit, or delete comments in Excel 2016 - 2007. 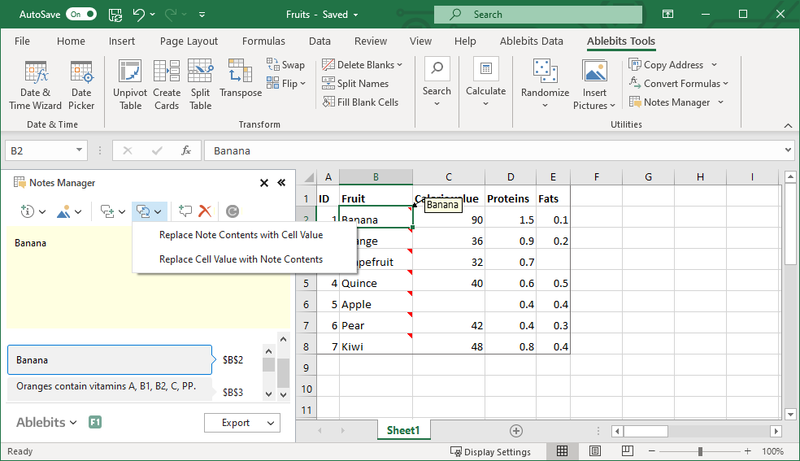 With this tool, you can easily convert cell contents to notes and vice versa, copy comments right from the add-in's pane, and export the notes. You can even insert a picture in your comment, add author, current date, or time. 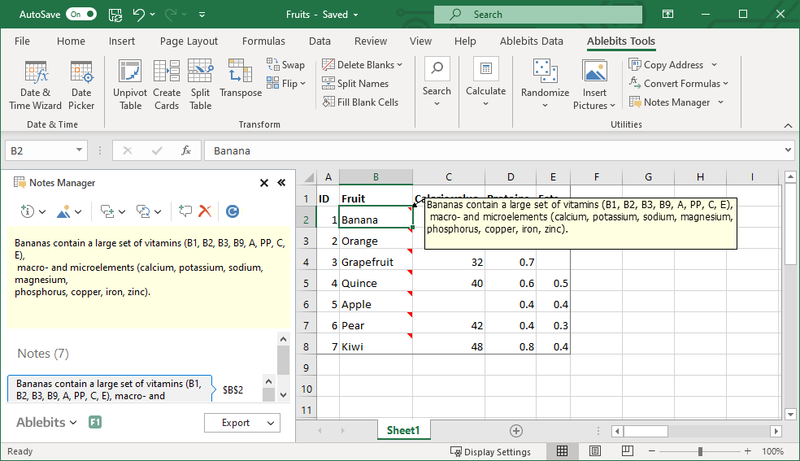 Insert comment in Excel Type a new comment on the add-in pane to have it in a cell. 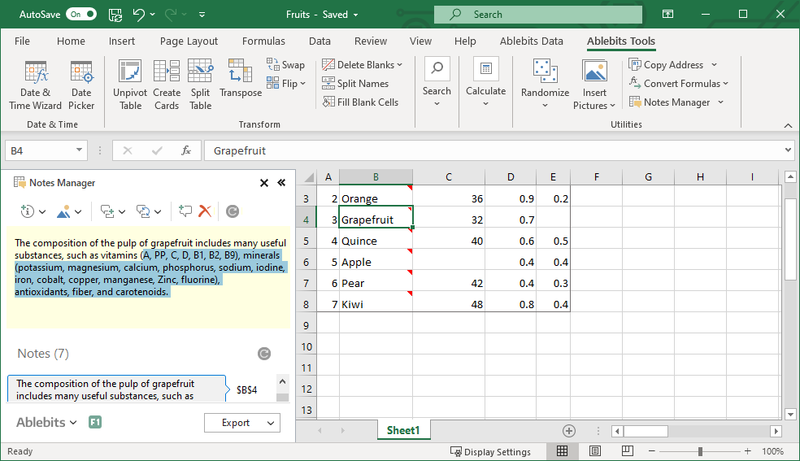 Copy comments to other cells Drag and drop comments to cells directly from the add-in pane. Insert picture, author, date, or time Add pictures as comments, insert current date, time, or author. Navigate among notes to edit them easily Use the pane to move between the notes, edit, and delete them. 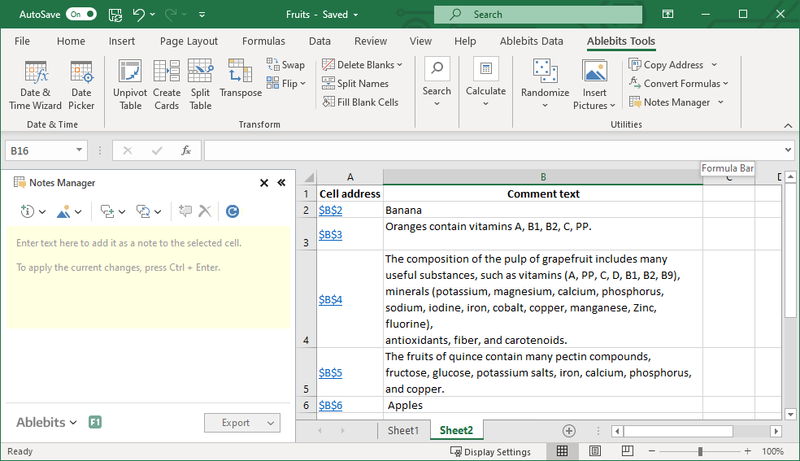 Turn comments into cells and vice versa Convert cells' contents into comments or put the notes into cells. Export notes to another file Export comments with their cell references to another workbook. What is Comments Manager and what do I need it for? 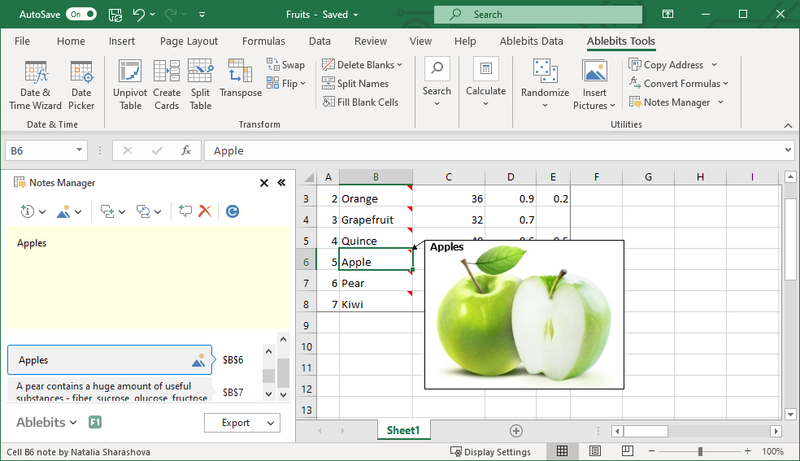 The add-in is designed to ease your work with comments in Excel 2016-2007. It displays all comments in a tree-view and allows you to navigate between them. Comments Manager lets you quickly add, edit, delete, copy, and export the comments. What's more, you'll be able to turn the cell contents into a comment and vice versa. Also, there's an option to insert the author's name, date and time, and even pictures to comments. Why would I want to use the add-in when there are standard means to work with comments in Excel? The standard Excel options are a bit more cumbersome than necessary. For example, to edit a comment, you need to right-click the cell, select the "Show/Hide Comments" from the context menu, and when the note appears, click it and edit its text. Also, the comment's author name is always inserted automatically. If you don't need it, you'll have to delete it manually every time. With our add-in, you decide whether to show or not to show the author name in your comments. Additionally, you have a wider range of options to work with notes: copy and delete in a click, convert to a cell's value, add picture, date, and time. How to insert a comment in Excel with Comments Manager? Put the cursor into a cell of interest. Enter the text on the add-in pane. How do I manage comments with your add-in? Put the cursor into the cell with a comment. Choose one of the options on the add-in pane. Is the comment author name inserted by default? No, only you decide when to insert the author name into a note. Can I insert pictures in comments? Yes, with ease. Just click the corresponding button on the add-in pane. Can I quickly move the text from a comment to a cell? Yes. The simplest way is to drag and drop any comment from the add-in pane right into a cell. Or you can use one of the following options: replace the cell's contents with a comment or add the comment to whatever is already in a cell.